Allemagne Comprenant la Prusse et la Confederation Germanique. 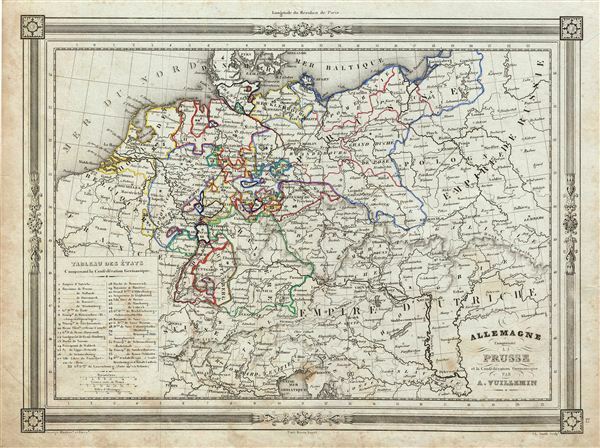 An uncommon and extremely attractive 1852 map of Germany and Prussia. Covers the German states from the border with Holland and Belgium eastward as far as Poland and Russia; and extends south to include Bavaria. This map also shows parts of the empire of Russia, the Austrian empire, Belgium and France. Throughout, the map identifies various cities, towns, rivers and assortment of additional topographical details. Prussia attained its greatest importance in the 18th and 19th centuries when it dominated northern Germany politically, economically, and in population. The German Confederation, created in 1814, acted as a buffer zone between Austria and Prussia, its two largest and most powerful member states. Nonetheless the rivalry between the two powerful states increased until it finally broke out into the Austro-Prussian War. Prussia won the Austro-Prussian War in 1866 which ultimately led to the collapse of the German Confederation. A few years later, in 1871, most of the former Confederation states were folded into the newly proclaimed German empire. The map features a beautiful frame style border. Prepared by A. Vuillemin for publication as plate no. 12 in Maison Basset's 1852 edition of Atlas Illustre Destine a l'enseignement de la Geographie elementaire.